Scarves, originally uploaded by Craftydiddl. Thanx for the comments on them i am not fishing for more : ) But this time i wanted to add details since i am not mad at my wireless on/off switch anymore. 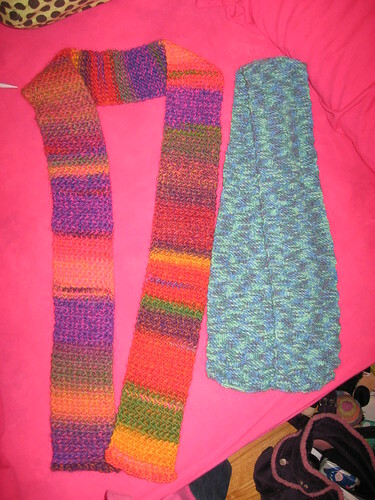 So the Rainbow-y Scarf is mine-it’s more of a long skinny scarf that you can wrap around a lot or let it hang down. I looked back and i started this around the beginning of October-not as far back as i thought-yay. Wolle Rodel Maxi-Color-it’s a bulky yarn and i used a size 9 needle. The fabric turned out nice and thick so the wind can’t get thru but at the same time it’s not stiff. i did it in the basketweave pattern (i think) it’s K5, P5, K5, P5 for 5 rows and then the opposite for 5 rows and so on and so on. I didn’t want the scarf to have a wrong side. Today Little Man and I had a Jammie Day. i did some dishes and started on my MONSTER PILE of laundry. I really let it get behind with all the holiday gatherings. Little Man’s fave part of the day was going to Walgreen’s IN OUR JAMMIES-he kept looking at me, grinning at asking “Mommy. what are we wearing” anyway we went and pickd up over 450 pictures. Yeah-apart from my Germany pics, Mommy got really behind on her pics. Good news is i have about half of them put away in albums. Do you have any exciting plans for New Years? We will probably just be hangin out-In our jammies!!! and i will do some knitting of course-Gotta start the New Year off right!